This explorer tour takes in major attractions of both the North and South Island, while also guiding you to some favourite holiday destinations of the locals, like the Coromandel Peninsula. Along the way you’ll enjoy two night stays to ensure you really experience New Zealand and have time to enjoy the many activities on offer. We’ve also included four very different scenic cruises, beginning with a cruise in the sub-tropical Bay of Islands and finishing with a nature cruise in the pristine Milford Sound. At the right time of year you might spot dolphins, penguins, seals and royal albatross. 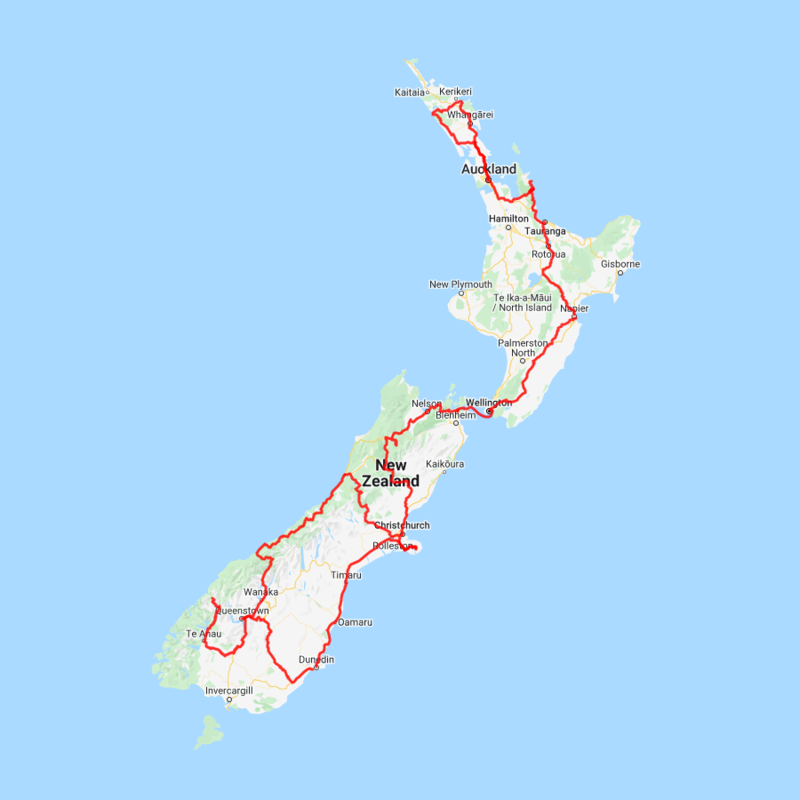 The drive north to Waipoua Forest and the Kauri Coast takes you along the remote West Coast of the North Island and around one of the world's largest natural harbours, the Kaipara Harbour. The region was worked by immigrant Dalmatians who toiled to make a living from the gum fields. A visit to the Kauri Museum at Matakohe tells the story of their hardships and pioneering spirit and of the remarkable impact this tree had on the region and the wider world - and is must do. You'll have plenty of opportunity to stop along this spectacular route, so be sure to leave time for sightseeing. Situated at Omapere, right on the waters edge of the Hokianga Harbour with a stunning view to huge sand dunes across the bay the Copthorne Hotel and Resort Hokianga is a perfect place to discover the rich history and beauty of the Hokianga. Heading east from the Hokianga, a detour to Rawene is recommended (signposted) to view the historic wooden buildings on the harbour and stop for a break at the Boatshed Cafe, sitting on the water with fantastic views. Crossing from the West Coast to the east you soon arrive at the subtropical Bay of Islands. A slight detour north will take you to Kerikeri, famous for its crafts and fruit orchards, it’s also the largest township in the region. Kerikeri is home to New Zealand's oldest standing European buildings, the Stone Store and Kemp House, both are open to visitors. Continue on to Paihia, an excellent base to explore the Bay of Islands. Nearby is a wealth of early New Zealand history, learn about the signing of the Treaty at Waitangi and Maori culture. Across the harbour is the cute village of Russell, with many historic buildings, a lovely place to explore. Paihia is also the launching point for many marine encounters, swim with the dolphins, kayak or cruise the beautiful Bay of Islands - there are many ways to experience this paradise. Today make your way back down the country to Auckland. Pass Kawakawa, famous for its Hundertwasser toilets. Go through Whangarei and Warkworth, and make time for a side trip to Matakana, known for beaches and vineyards. Stretch your legs in Puhoi, New Zealand's only bohemian settlement. Continue on through the outer Auckland North Shore suburbs before crossing the harbour bridge to arrive in the central city. As you leave Auckland you'll cross the fertile plains of the Hauraki before passing the Thames Estuary - a haven for wildlife and shore birds. After arriving into the historic gold mining town of Thames, choose to follow the scenic route along the Pohutukawa Coast (part of the Pacific Coast Highway). As one of the most spectacular drives in the region leave yourself plenty of time for photos and sightseeing. Plan to arrive into Coromandel Township for lunch before heading down the east coast towards popular seaside destinations Whitianga and then Tairua. Puka Park Resort is situated on the eastern side of the Coromandel Peninsula. Nestled amongst 25 acres of New Zealand's most beautiful native bush this prestigious hideaway offers luxury and seclusion at its best. The Art Deco Masonic Hotel occupies a significant historic building on Napier’s waterfront and has been richly refurbished in keeping with the Art Deco architecture. With its central location and decadent décor, this is the best place to experience what Napier is famous for. Located just 2 minutes walk to Te Papa Museum, the vibrant Courtney Place and local Theatres the Copthorne Hotel Oriental Bay is in a superb location to enjoy Wellington. The Rutherford Hotel Nelson offers luxurious accommodation with a full complement of features designed to help you achieve the most from your stay. Situated at the doorstep of three national parks and an unmatched range of sandy beaches, blue seas and mountain wilderness. Leaving Nelson City you will pass through the suburb of Richmond. Moving on you will travel through the Nelson Lakes and Kahurangi National Park region, trees, rivers and valleys accompany you now as you head towards the town of Murchison. Murchison is a quiet place and a great lunch stop. Underneath its sleepy farming facade is an adventurers paradise with white water rafting, jet boating, gold panning, kayaking, 4WD trips and excellent trout fishing. From Murchison you will head south towards Maruia Springs, which has been attracting travellers for years and the natural hot springs are now located within an authentic japanese themed resort, a great place to stop for a soak if time allows. Head inland over the Lewis Pass where the landscape changes to a sub alpine zone with large forests of red and silver beech. Near the summit a short walking track, the Tarn Nature Walk, is an ideal place to break your journey. The drive south to Christchurch takes you through some fine rolling farmland and North Canterbury's major wine region, the Waipara Valley. A leisurely 2 hour cruise in the sheltered Akaroa Harbour. Cruising aboard a modern catamaran, the 60 feet / 20 meter Black Cat is perfect for viewing the natural wonders of the harbour. The vessel is the largest and most luxurious on the harbour. There's lots of space on the 2 decks for unimpeded viewing and inside you will find a bar and toilets. The vessel offers comfortable, safe and stable comfort. The highlight of this trip is undoubtedly the sighting of one of the world's smallest and rarest dolphins, the Hector's or New Zealand Dolphin. These friendly and inquisitive mammals meet the boat most days throughout the year and their calves can be seen between October and March. Also on the trip you will catch glimpses of the White Flippered Blue Penguin, the smallest penguin in the world. There are many different bird species in the harbour, including five different cormorant species and the chance of sighting the endangered yellow-eyed penguin. You'll also see the New Zealand Fur Seal sunning themselves on the harbours rocks near the entrance at Seal Bay and you also get to stop at Lucas Bay to see at a salmon farm where thousands of salmon from fingerlings to adult fish are farmed in a series of cages. This is where the world-famous 'Akaroa Salmon' are raised. Crossing the vast Canterbury Plains as you head South, State Highway 1 crosses many braided rivers that start their life as glacial melt water high in the Southern Alps. New Zealand's longest bridge at Rakaia crosses such an example. The towns of Timaru followed by Oamaru are worth a short detour to the town centre. The town of Oamaru is most famous for its buildings constructed with the unique locally quarried white stone. Explore the old quarter or if you don't mind a late arrival into Dunedin then stay around to see the blue penguins come ashore at dusk. Just a little further south and you arrive at Moeraki and its famous Moeraki Boulders. Following a look at these incredible and unique geological features don't miss taking a late lunch or coffee and cake at Fleur's Cafe in Moeraki Township. 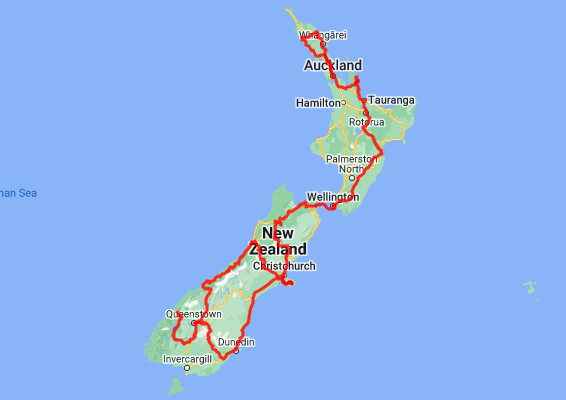 The last stretch of road follows the coastline before crossing the hills and descending into the city of Dunedin.